Time to get caught up with what’s been going on at your Library! 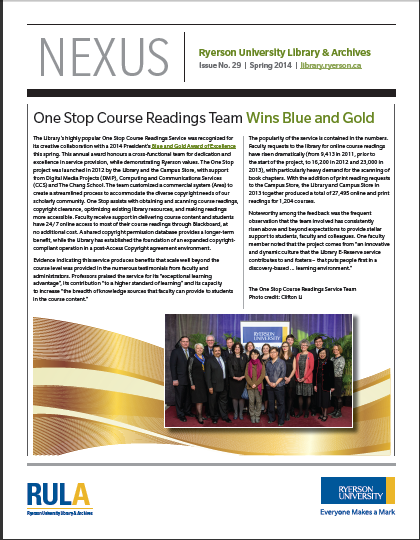 The Spring issue of NEXUS, the Library newsletter, is now available online. Highlights include the One Stop Course Readings Team receiving the Blue and Gold Award, the Library’s participation in the Transmedia Hackathon, and much more. Enjoy the read! 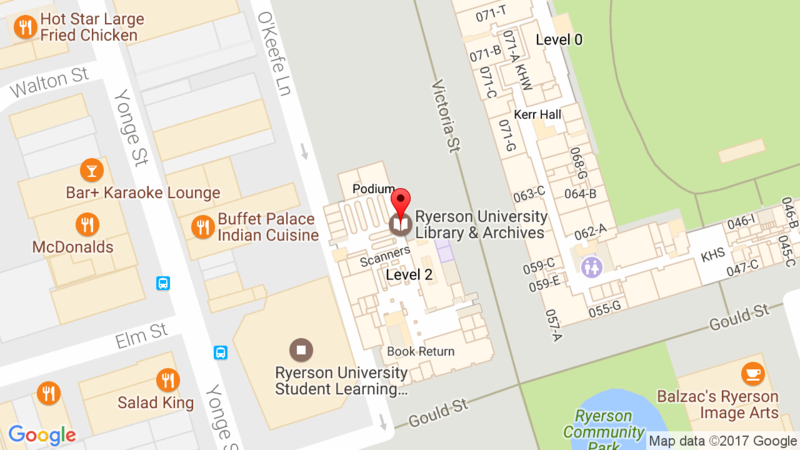 Get up to speed with what’s happening at the Library! The latest issue of NEXUS, the Library newsletter, is available online. Highlights include the Library’s award-winning BookFinder application, the arrival of Dr. Joe MacInnis, the Library’s first Distinguished Visiting Professor, and much more. Enjoy the read! Need a distraction from exams? The latest issue of NEXUS, the Library newsletter, is now available online. Happy reading! 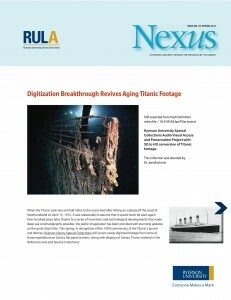 The Spring 2012 issue of Nexus, the library’s newsletter, is now available online! This will be the last issue of Nexus for this academic year. Have a safe and enjoyable summer. We’ll be back with another issue in the fall! The Fall issue of Nexus is available on the web in PDF format. Take a study break to browse through and let us know what you think! Hot off the digital press! The Spring issue of NEXUS, the Library newsletter, is available online. Highlights from this issue include award-winning mobile apps, and Search Everything, a new search tool on the Library’s home page that allows you to access the majority of the Library’s resources with a single search.
. Highlights from this issue include the Library’s involvement in the Faculty Teaching Chairs initiative, Open Access initiatives at the Library, and an update from our Learning Commons partners. The Spring issue of NEXUS, the Library newsletter, is available online. Highlights in this issue include an update on the Student Learning Centre, the Ronald D. Besse Information and Learning Commons Open House and the development of a Library Student Advisory Committee.